The name of "GATTER" means "Gate", and is describing in the south of German speaking Europe the "dweller by the gate". Related names of a similar origin are GATTERER, GATTERMANN, GATTERMAN, GATTERBAUER, GATTERHUBER, GATTERMAIER, GATTEREDER, GATTERDER, GATTERSTALLER, and GATTERSTEIGER. The first evidence of this name is found in the year 1361 in the German city of Speyer (house name HEINRICH ZU DEN GATTERN). Due to a phonetic shift that has occured over the centuries, the name has in some cases turned into GATER, KATTER, and CATTER. Related names have sometimes turned into GATERMANN, KATTERMANN, CATTERMANN, KATTERBAUER, KATERBAUER, GATERMAYER, and GOTTERMAIER. One of several fake coat of arms of the Gatter family, produced by dubious genealogy institutes. 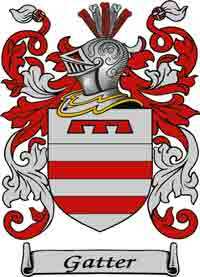 The British GATTER family name has several different origins. The name seems to have developped due to a phonetical shift from GATER, GOATER or GATHER, in some cases even from CATTER. After the norman conquest of Britain in the year 1066 the first evidence of this name is found: Walter LE GATER mentioned in 1279 in the Rotuli Hundredorum is the first bearer of this name. He is followed in 1301 by Robert GATER mentioned in the Sussex Subsidy Rolls. The same source names in 1332 William LE GATIER. The old-english gât means "goat". One origin of GATTER could therefore be "goat-herd(er)", that has developped due to a preservation of the northern â into names like GOATER, GOATHER, and GAITER. An alterantive explanation is derived from the old nordic word gata meaning "road" and thus, describing the "dweller by the road". Possible is also a parallel development to the names GATE, GATES, YATE(S) and GATER, which all go back to the word "gate". This name is describing the "dweller by the gate(s)". Early examples are Ailricus DE LA GATA in 1196 in Devonshire, Ralph DE GATES 1202 in Oxfordshire, Gilbert ATTE GATE 1260 in Cambridgeshire and Richard OVERTHEGATE 1327 in Derbyshire. If the latter were the origin of the British name of GATTER, then at least linguistically there were a connection between the origins of Continental and British bearers of this name. Blood relations however do not seem to exist between these two families of this name (unless we can prove an early migration from the Continet to Britain (vice versa)). This would however have to have taken place before the 15th century, since the name in its today spelling of "GATTER" is already found in both areas at that time.